Whenever I stop my son from eating any so-called unhealthy food, he will show me a sad face with his droopy bottom lip. 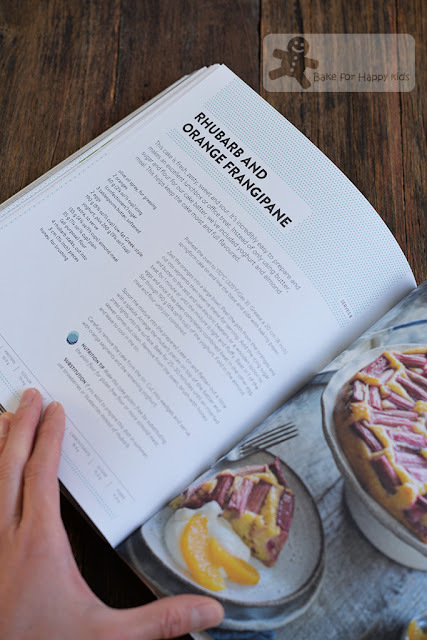 To satisfy our craving for comforting food, I'm constantly looking for recipes that can create food with a different perspective. 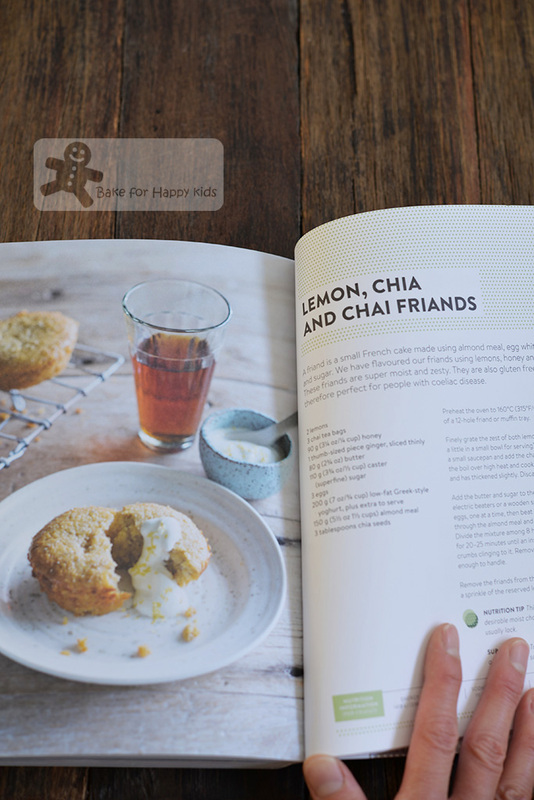 Recipes that use fresh and healthy ingredients to transform the so-called unhealthy food into nutritionally balanced treats that we would desire! Thanks to this book, Quick. Easy. Healthy. 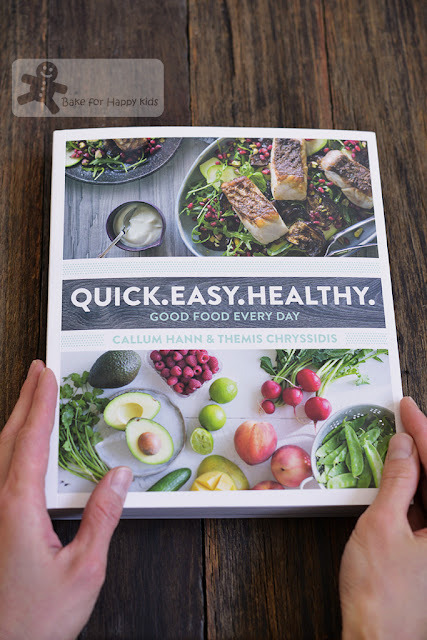 Good Food Every Day by Callum Hann and Themis Chryssidis, I have found one recipe that is really GOOD! 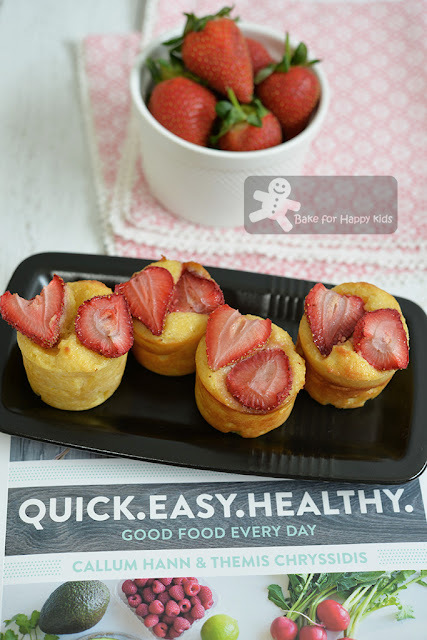 Good because it can bake this strawberry orange frangipane cake that is easy to bake, super moist and tasty to eat and nutritionally balanced for our health. Step 1: Preheat oven to 170°C / 325°F and grease one 20 cm or ten mini 5 cm diameter springform / loose bottom cake tin. You see here that this cake is mostly made of ground almond. Step 3: Wash, hull and cut 250g strawberries into halves. 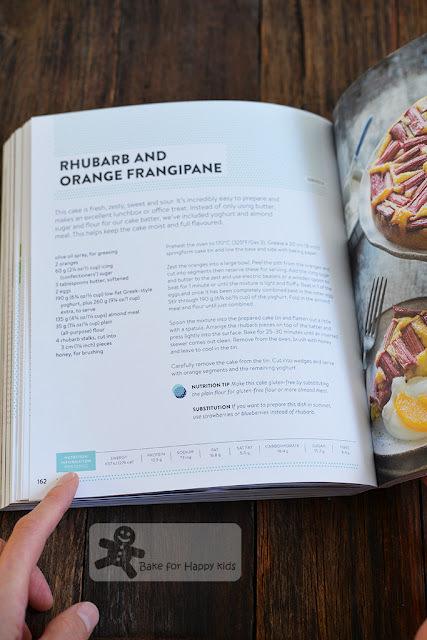 The original recipe uses 4 rhubarb stalks cut into 3 cm pieces and says that we can use either strawberries or blueberries instead of rhubarb. 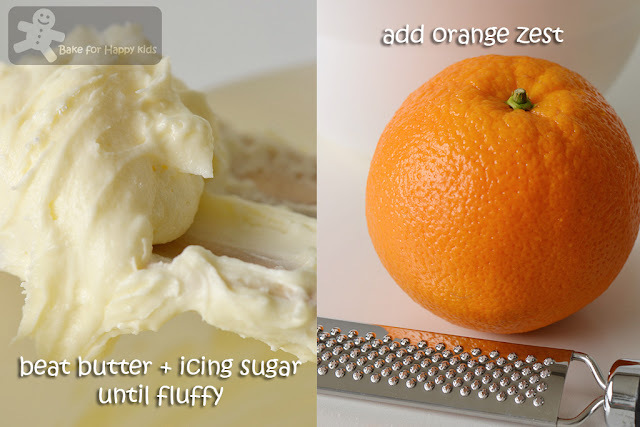 Step 4: Using an electric mixer with paddle attachment or a wooden spoon, beat 50g butter (softened at room temperature), 60g (1/2 cup) icing sugar and finely grated zest of 1 large orange or 2 small oranges until light and fluffy. There is no much butter in this batter and so it's not tedious to use a wooden spoon to do the mixing. 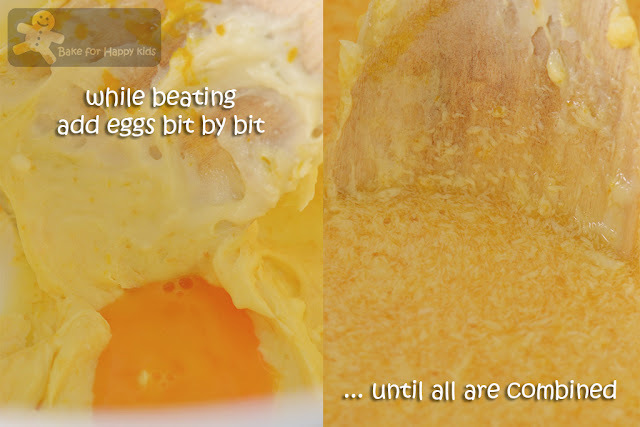 Step 5: Beat in 2 large eggs, one at a time or bit by bit. 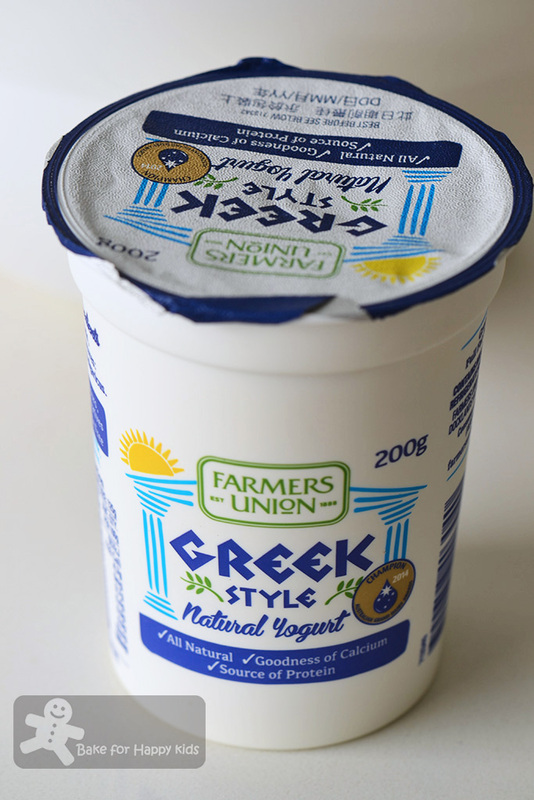 Step 6: Stir in 190g Greek Style yogurt. The book says that it's ok to use the low fat ones but I'm the regular one with 10% fat. 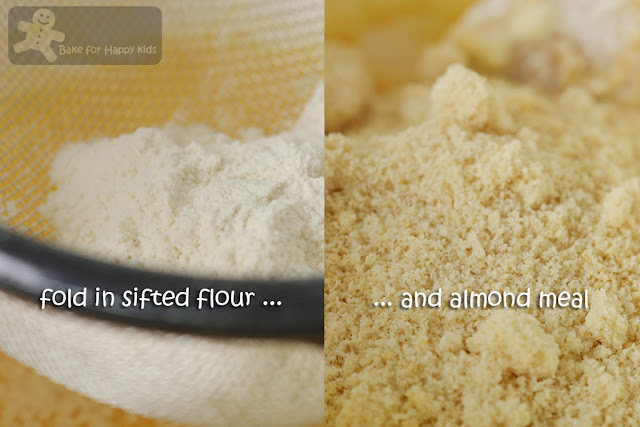 Step 7: Using a spoon, fold in 35g all purpose flour (sifted) and all of the pre-roasted and cooled ground almond. If you wish to make this cake into gluten free, you can substitute the plain flour with gluten free plain flour or 35g extra almond meal. I like to stick to the addition of flour as the presence of gluten will give the a nice bouncy texture. Step 8: Spoon mixture into the prepared tin and use a spatula to flatten out the batter. 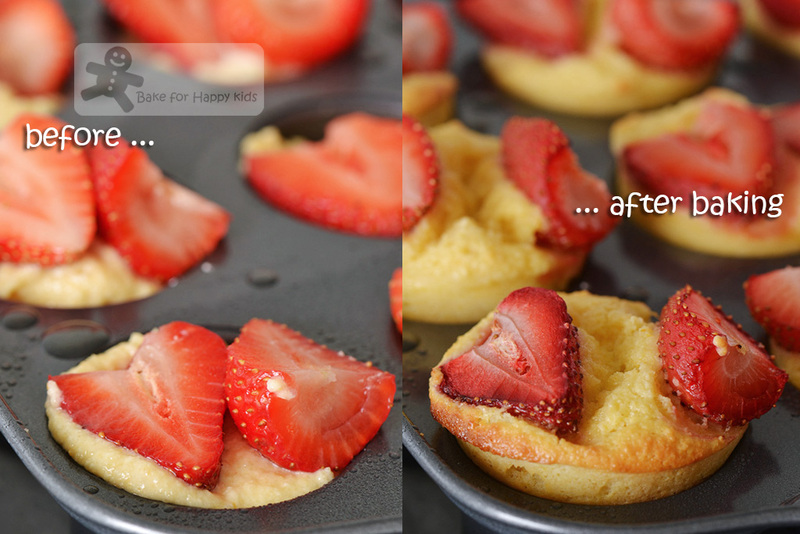 Arrange the fruit pieces on top of the batter and bake for 25-30 mins until an inserted skewer comes out clean. As this is a moist batter, my mini cakes took the same 30 mins to bake too! These cakes look so YUM!!! Step 9: Remove from the oven, brush with honey and leave to cool in the tin. I must say that this step is pretty essential as it makes the cakes looking real good and make the fruits taste less tart. All done!!! This is indeed a real quick, easy and healthy recipe! 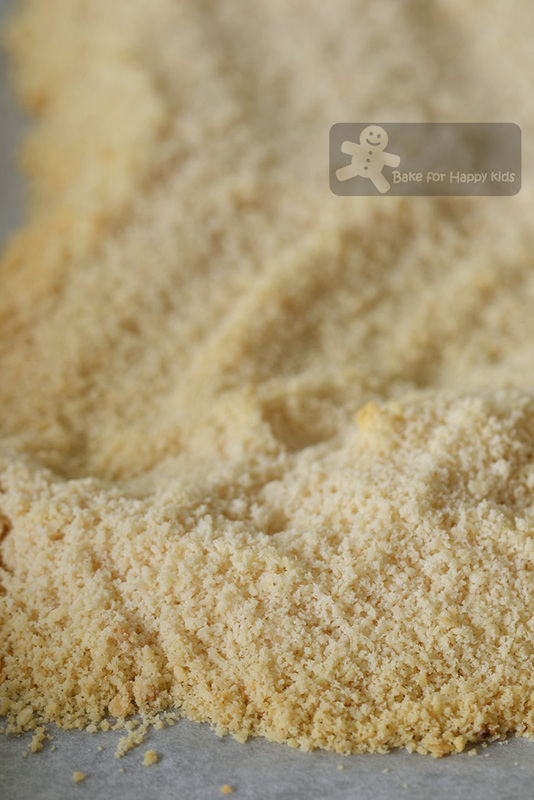 Notice that there is no baking powder used in this recipe? I have double-checked it a million times and million times sure that there should be NO baking powder in it. Hence, you know that this is the not fluffy kind of cake and yet it is so moist and tasty. Me happy that I have baked these comforting cakes to satisfy our sweet cravings with no excuses and no worries? Yes, I am. My junk-food-loving son ate these cakes but didn't say that he is madly in love with these... LOL! Well, I guess this is a classic case of you need two hands to clap... Does my son need to be educated further to love eating healthy food? Or are all desirable cakes supposed to be loaded with fat and sugar? Hmmm... I like these so-called healthy cakes. Do you? by Callum Hann, runner-up of MasterChef Australia series 2 and his friend, Themis Chryssidis. As mentioned in my review before at here, more than 70 recipes in this book are divided into seasons. 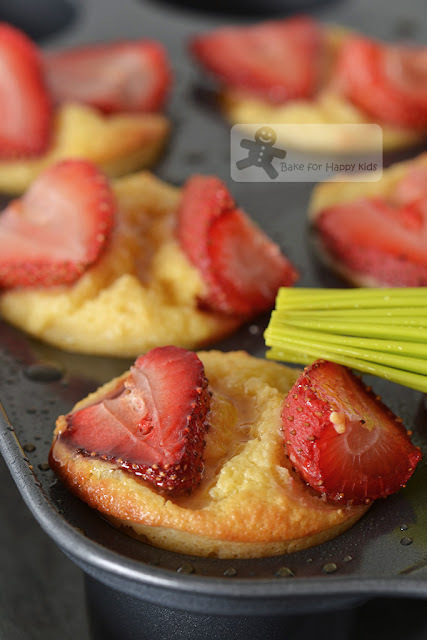 And this Strawberry Orange Frangipane is one of the winter recipes. I feel good knowing these cakes are not excessively loaded with fat and sugar and are high in their protein and fiber content. More comforting recipes to cook for winter? 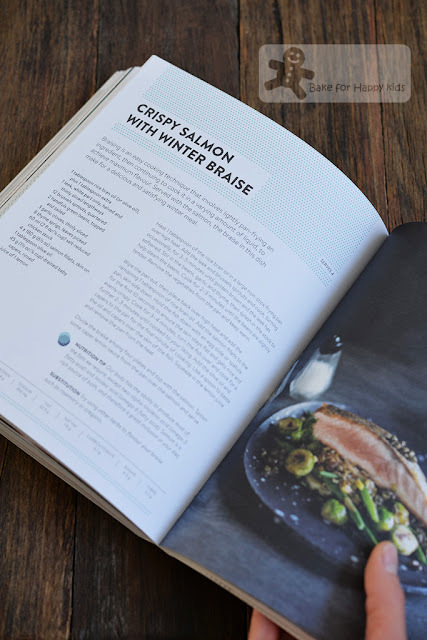 There are heaps including this that I would love to cook for my salmon-loving son. Wow! I can imagine this coconut-poached chicken must be very moist and flavoursome! 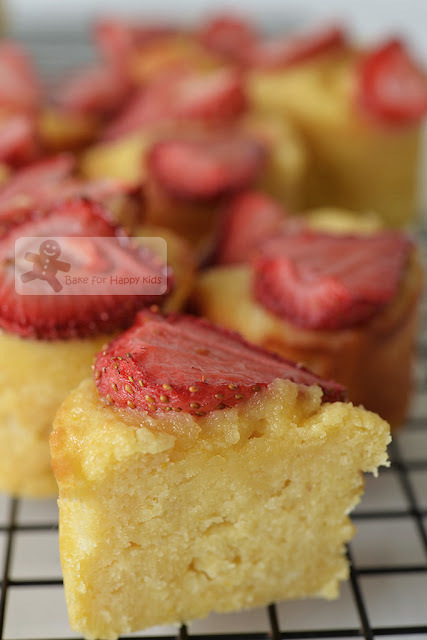 This recipe says that it can make these super moist and zesty friands. Yummy... Must try! Must try! I can't wait for the arrival of Spring so that I can fill my shopping bags with the seasonal asparagus, peas, strawberries and mangoes. Do you know what to shop for every season? 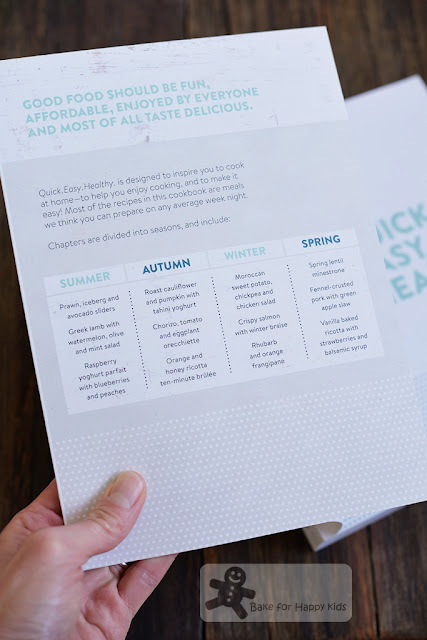 A healthy shopping list is also mentioned in the beginning of every chapter in this book. 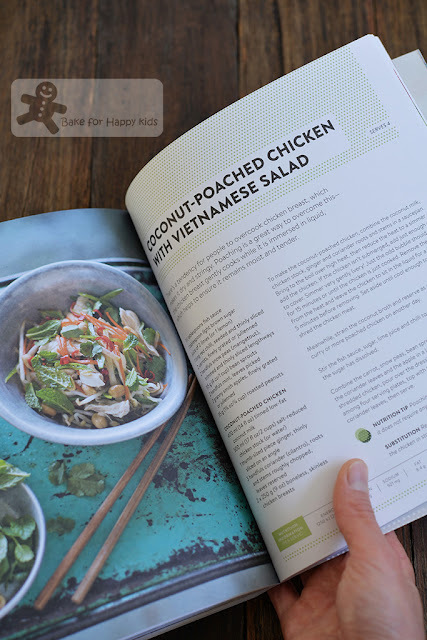 Whether it is Spring, Summer, Autumn or Winter, I know that my family and I will eat well with the help of this healthy good food cookbook and like to recommend this fantastic book to you. Want to know more? See here for my previous review. 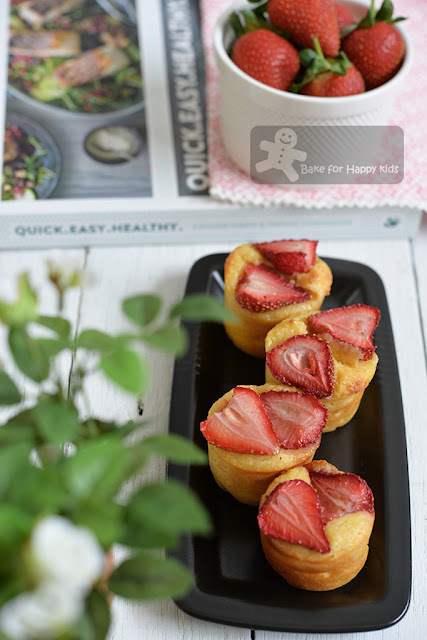 Thanks for sharing this low fat healthy cake. I'm sure guilt free to have few at a go for me ^-^! Zoe, frangipane is so delicious! I do love your mini cakes! Mmmm, frangipane. Good stuff. And this looks terrific -- I'd be disappointed if you took THIS away from me, not junk food! Ooo... wish I can have these for breakfast ! Hmm... salivating. Enjoy your day ahead dear.